Mercedes had taken time to make sure that its re-entry into Grand Prix racing was well-prepared. Indeed, the elegant streamlined contour of the new Mercedes racers was absolutely novel, marking a complete move away from the familiar traditional racing car design. The competitors were dumbfounded and speechless. But for the virtually 300,000 spectators at the race track, the appearance of the W196R was a true sensation. Mercedes fielded three cars of the type W196R, and they were piloted by Juan Manuel Fangio, Karl Kling, and young Hans Herrmann respectively. 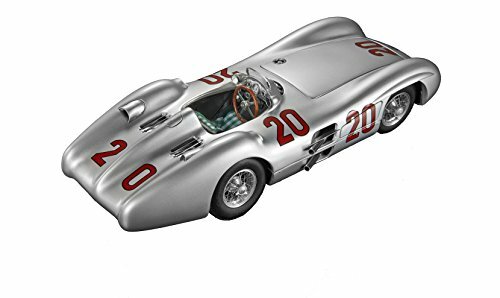 The premiere race of GP France on July 4, 1954 played right into the hands of Mercedes, for the fast track of Reims with its long straights was conducive to outstanding performance of the Silver Arrows. Fangio (starting number 18) and Kling (starting number 20) started off in the front row beside Ascari in a Maserati 250F. After Ascari retired from the race in lap 1, the two Ferraris of Gonzalez and Hawthorn came to chase the two leading W196R of Fangio and Kling from right behind. With starting number 22, Hans Herrmann had taken off from the 3rd row at position 5. After seven laps, however, he passed Hawthorn and, then, overtook Gonzales in the 11th lap. Now all the three W196R were leading the race until the 17th lap, when Hans Herrmann had to call quits because of an engine failure. Towards the end of the race, a dramatic battle for championship took place between Fangio and Kling. It was by a razor-thin margin that Fangio won out; he was barely 1 meter ahead of Kling when passing the finish line.